Book Jacket: "The youngest daughter of one of the founding patriarchs of middle Tennessee and the niece of Andrew Jackson, Emily Tennessee Donelson seemed destined for the life of a southern plantation mistress. At seventeen, she married her first cousin Andrew J. Donelson, the namesake and ward of General Jackson. Four years later, however, her life changed dramatically as she and her husband traveled to Washington to serve her uncle in the White House. Andrew Donelson became the president’s private secretary, and Emily assumed the role of White House hostess, filling a void left by the death of Jackson’s beloved wife, Rachel, shortly after the election. Emily soon found herself immersed in the central controversy of the first Jackson administration, the Eaton Affair. It began as a petticoat scandal involving the social acceptance of Margaret Eaton, the new wife of Secretary of State John Eaton, who was reportedly a woman of loose character. Jackson assumed the rumors to be the work of his political rivals and was shocked when Emily and her husband spurned Mrs. Eaton. The controversy consumed the first two years of the Jackson presidency, and the Donelsons left Washington rather than betray their moral stance. Eaton eventually resigned, and the Donelsons returned to the capital. Restored to Washington, Emily reveled in the local society and took charge of her four children, the largest number to be born in the White House. Emily Donelson of Tennessee provides a fascinating chronicle of the social and political culture of Jacksonian America. Politicians and events in both Washington and Tennessee come alive in this book—in large part because Pauline Burke's unique position as a descendant of the Donelson family enabled her to draw on a rich trove of oral history, letters, and journals. Originally published in two volumes in 1941, this new, abridged edition of Emily Donelson of Tennessee is an engaging account of a woman who embraced traditional nineteenth-century gender roles. Additionally, the book highlights the author’s own responses to the changing position of women in society." Taryn's Review: Emily Tennessee Donelson was a really interesting person that the general public of today is not well acquainted with, unfortunately. At the young age of 21 she served as the White House hostess for President Andrew Jackson in place of Jackson's wife Rachel, who had died before the big move to Washington, D.C..
Donelson grew up on the Tennessee frontier and came from a long line of esteemed families. 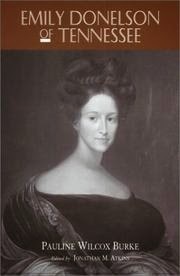 She was a niece of Rachel Jackson, thus Donelson spent much time during her youth at the home of her Aunt and Uncle Jackson at The Hermitage (in Nashville). She married her first cousin Andrew Jackson Donelson, who served as President Jackson's private secretary, so Emily Donelson was decided as the heir to role of White House hostess. She was adored by many, so it seemed only natural to Jackson that Donelson would do the role his deceased wife could not. This book was written by a descendant of Emily Donelson, so there is some bias. Interestingly enough, although not intended by the author, Burke's own personal understanding of womanhood and domestic achievement colored the text substantially. The book was published in 1941, so it provided a great lens into the thoughts regarding womanhood from the view of twentieth century woman discussing her nineteenth century subject. The book portrayed Emily Donelson in a charming light and, being that Burke was of Donelson's family line, she had access to some great primary documents that are published throughout the book, namely in the form of letters between Donelson and others. Jackson's letters to his niece also reflect the deep love and affection he held for her. This book is great for those who loving knowing history that is off the beaten path and for those who want to be introduced to the much loved White House mistress of the Jackson administration.